The 9th edition of annual Vijay Awards 2015 held on April 25th evening at Jawaharlal Nehru Indoor Stadium in Chennai and the channel is planning to telecast the event on TV next month. Despite Kamal Haasan shaking a leg with daughter Shruti and clicking a selfie, colorful dance performances on huge stage, the 2015 Vijay TV Awards has come under full blast for its choice of winners, controversy of rigging, and putting on a dull show. 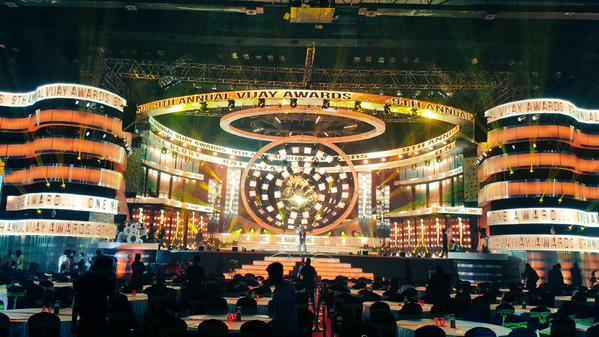 Buzz is that all is not well at Vijay Awards as it seems that celebrities irked with the organizers. It is known fact that Ilayaraja does not like to attend any Awards functions. But, the jury of Vijay Awards managed to convince him to be present at the event. Ilaiyaraaja, frankly told them at the outset, “If I ever come, I will be there only for an hour and once I get the award, I will leave”. Ilayaraja graced the occasion to receive ‘Chevalier Sivaji Ganesan’ Award, no one was around to present him with the award and after waiting for a while, the legend left the venue without receiving the prestigious award. Maestro was upset when he came to know that anyone from Sivaji Ganesan’s family was not present to confer the award to him. So, he irked and walked out of the venue. He was not called on stage in that duration. Vijay TV always used to promote themselves by saying Sivakarthikeyan is like their own son and everyone is aware that last year when the actor emotionally broke down, they went overboard and repeatedly telecast the visuals and boosted their TRP ratings. But this year, Actor Sivakarthikeyan has openly criticized the organizers of Vijay Awards. He said “This event will last till early morning 2 am, but they don’t even provide us water. Bring tomato rice and tamarind rice from next year”. Sure they cannot air Siva's speech. 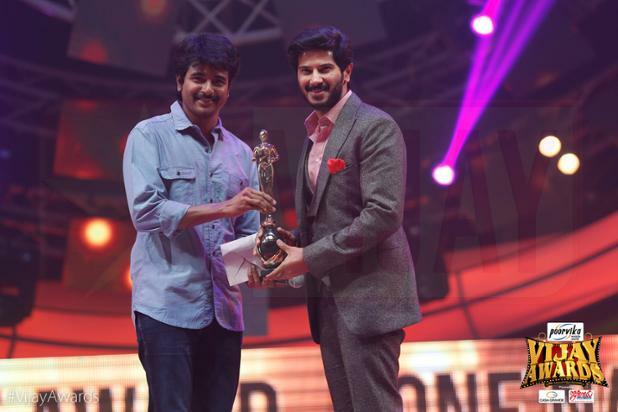 Normally, during Vijay Awards, Sivakarthikeyan comes first and will be present throughout the function but this time after presenting the Best Debut Actor award to Dulquer Salmaan (Vaayai Moodi Pesavum), no one saw Sivakarthikeyan at the event. Also, Rajini Murugan’s first look was first announced to be unveiled at Vijay Awards but they released the same on Twitter by 6 PM itself. Usually, when DD hosts a function, she is the one who tends to speak a lot and provides minimum time for the guests at the mic! At this year's Vijay Awards function, DD hosted the function along with Gopinath. At one point, no one understood what she was trying to say. KS Ravikumar openly mocked this on stage when he got the Special Jury Award for Soundarya Rajinikanth's work in Kochadaiiyaan. Entertainer of the Year award is considered the biggest honour to be given by Vijay Awards. But this year they didn't even announce the award. Top actors such as Vijay, Suriya and Karthi didn't attend the function and only Kamal Haasan and Dhanush were present. Arya and Jayam Ravi too, left the function midway. Among the top heroines only Hansika and Lakshmi Menon were present. Last year, there were interesting moments such as Vijay & Shah Rukh Khan's dance, and Vijay Sethupathi & Nayanthara's comic conversation. This year, only a few moments like Kushboo-Hansika dance and Sivakarthikeyan giving the award to Dulquer were interesting. Prabhu Deva, Shruthi Haasan, Lakshmi Menon and Pooja Kumar danced at the event. Audiences and celebs who attended the event noticed that most of the awards have gone to the movies such as Jigarthanda, Cuckoo etc which Vijay TV acquired satellite rights. Irritated and disappointed fans expressed their hates towards the award function with #RIPvijayawards hashtags. I don't go to vijay tv awards because of mahendran who decides the awards other than talent !!! So I don't respect tht and its my decision. *outside world never comes to know the inside politics ... And I think time is changing and for sure one day things will become better ! It is also heard that the performances given by actors did not entertain the audiences. However Shruti Haasan and Kamal Haasan’s duet dance performance and their selfie’s are highlight of Vijay Awards 2015.